While the Dow and other indices are popularly interpreted as indicators of broader stock market performance, the stocks composing these indices may not represent an investor’s actual portfolio or strategy. A quick online search for “Dow rallies 500 points” yields a cascade of news stories with similar titles, as does a similar search for “Dow drops 500 points.” These types of headlines may make little sense to many investors, given that a “point” for the Dow and what it means for their own portfolios is unclear. The potential for misunderstanding also exists among even experienced market participants. Given that index levels have risen over time, potential emotional anchors such as a 500-point move do not have the same impact on performance as they used to. With this in mind, let’s consider what a point move in the Dow means and its impact on an hypothetical investment portfolio. The Dow Jones Industrial Average was first calculated in 1896 and currently consists of 30 large cap US stocks. The Dow is a price-weighted index, which is different than more common market capitalization-weighted indices like the S&P and Russell indexes.1 An example may help put this weighting methodology difference in perspective. Consider two companies that have a total market capitalization of $1,000. Company A has 1,000 shares outstanding that trade at $1 each, and Company B has 100 shares outstanding that trade at $10 each. In a market capitalization-weighted index, both companies would have the same weight since their total market caps are the same. However, in a price-weighted index, Company B would have a larger weight due to its higher stock price. This means that changes in Company B’s stock would be more impactful to a price-weighted index than they would be to a market cap-weighted index. The relative advantages and disadvantages of these methodologies are another topic, but our purpose of discussing these differences is to point out that design choices can have a large impact on index performance figures. Investors should be aware of this impact when comparing their own portfolios’ performance to a particular index. Movements in the Dow are often communicated in units known as points, which signify the level of index change. Because of this different methodology, investors should be cautious when interpreting headlines that reference point movements. A move of, say, 500 points in either direction is much less meaningful today than in the past largely because the overall index level is much higher today than it was many years ago. Exhibit 1 plots the magnitude of this decline in percentage terms over time. A 500-point drop in January 1985, when the Dow was near 1,300, equated to a nearly 39% loss. A 500-point drop in December 2003, when the Dow was near 10,000, meant a much smaller 5% decline in value. And a 500-point drop in early December 2018, when the Dow hovered near 25,000, resulted in only a 2% loss. 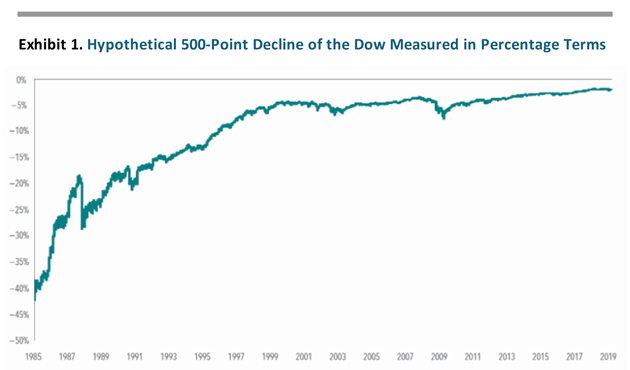 The chart illustrates what a 500-point drop would have been in percentage terms for the Dow Jones Industrial Average on a daily basis. It assumes a 500-point loss took place each trading day from January 1, 1985, to February 1, 2019, and uses daily historical closing values of the Dow Jones Industrial Average to compute the percentage change. Percentage change does not indicate the actual change in the Dow during the period shown. Actual results may vary. 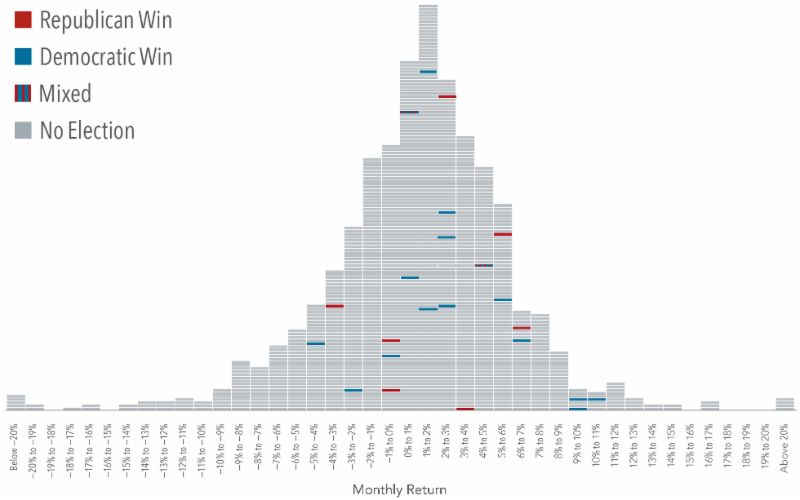 Performance of MSCI ACWI IMI, S&P 500, and Dow by Calendar Year Dow Jones and S&P 500 data © 2019 S&P Dow Jones Indices LLC, a division of S&P Global. All rights reserved. MSCI data © MSCI 2019, all rights reserved. MSCI ACWI IMI is the MSCI All Country World Investable Market Index (net dividends). Their performance does not reflect fees and expenses associated with the management of an actual portfolio. Past performance is no guarantee of future results. It is also important to note those planning long-term investment management strategies are concerned about other asset classes besides stocks. Depending on investor needs, a professionally diversified portfolio targeted toward the risk preferences, risk capacity and risk adhesion of a family a will often include a mix of global stocks, bonds, commodities, and any number of other assets not represented in a commercial stock index. A portfolio’s performance should always be evaluated within the context of an investor’s specific goals and time horizons for planning. Understanding how a personal portfolio compares to broadly published indices like the Dow can give investors context about how headlines apply to their own situation—or when comparing portfolios with a friend or colleague. An acute case of “returns envy” can often result in disappointment or even disaster if a sound strategy is abandoned simply to out-perform a neighbor. News headlines are written to grab your attention. A headline publicizing a 500-point move in the Dow is intended to trigger an emotional response and, depending on the direction, will sound either exciting or ominous enough to warrant reading the article. However, for serious wealth management, attention-getting headlines rarely offer practical insight for achieving reliable planning outcomes, especially for those investors with a philosophy based on modern financial science and a strategy integrated with their individual goals, needs, and preferences in a broadly diversified and cost-effective manner. Looking back at popular investment fads over recent decades can illustrate how often trendy investment themes come and go, along with investor money and their hopes. In the early 1990s, attention turned to the rising “Asian Tigers” of Hong Kong, Singapore, South Korea, and Taiwan. A decade later, much was written about the emergence of the “BRIC” countries of Brazil, Russia, India, and China and their new place in global markets. Similarly, funds targeting hot industries or novel trends with clever names have come into and fallen out of vogue. In the 1950s, the “Nifty Fifty” were all the rage. In the 1960s, “go-go” stocks and funds piqued investor interest. Later in the 20th century, growing belief in the emergence of a “new economy” led to the creation of funds poised to make the most of the rising importance of emerging information technology and telecommunication services. With the “Tech Bust” we all know how that turned out. During the 2000s, 130/30 funds, which used leverage to sell short certain stocks while going long others, became increasingly popular. In the wake of the 2008 financial crisis, “Black Swan” funds, “tail-risk-hedging” strategies, and “liquid alternatives” abounded. As investors reached for yield in a low interest-rate environment in the following years, other funds sprang up that claimed to offer increased income generation for those taking increased credit risks, and new strategies like unconstrained bond funds proliferated. More recently, strategies focused on peer-to-peer lending, cryptocurrencies, and even cannabis cultivation and private space exploration have become more fashionable. In this environment, so-called “FAANG” stocks and concentrated exchange-traded funds with catchy ticker symbols have also garnered inordinate attention among investors and gathered huge sums of speculative money that once again is not turning out so well. Unsurprisingly, however, numerous funds across the investment landscape were launched over the years only to subsequently close and fade from investor memory. While economic, demographic, technological, and environmental trends shape the world we live in, public markets aggregate a vast amount of dispersed information and drive it into security prices. Any individual trying to outguess or out-smart the market by constantly trading in and out of what’s hot today is competing against the extraordinary collective wisdom of millions of buyers and sellers around the world who set prices. With the benefit of hindsight, it is easy to point out the fortune one could have amassed by making just the right call on a specific industry, region, or individual security over a specific period or time. While these anecdotes can be entertaining, there is a wealth of compelling evidence that highlights the futility of attempting to identify mispricing in advance and profit from it. We often hear about winners, but rarely about losers. It is important to know that most investing fads, and indeed, most mutual funds, do not stand the test of time. A large proportion of funds fail to survive over the longer term. Of the 1,622 fixed income mutual funds in existence at the beginning of 2004, only 55% still even existed at the end of 2018. Similarly, among equity mutual funds, only 51% of the 2,786 funds available to US-based investors at the beginning of 2004 endured. The survival results of the exploding number of cheaply-traded ETFs are not any better. What is this change claiming to provide that is not already in my portfolio? If it is not in my portfolio, can I reasonably expect that including it or focusing on it will increase expected returns, reduce expected volatility, or help me achieve my investment goal more reliably? Do I know what they may be if something goes wrong? Will this change improve my investing confidence or my peace of mind? If investors are left with serious doubts after asking any of these questions, it may be wise to use caution before proceeding. Within equities, for example, the basic market portfolio of many index funds offers the benefit of exposure hundreds or thousands of companies possibly doing business around the world (depending on your selections) and possibly broad diversification across industries, sectors, and countries. While there can be good reasons to deviate from a market portfolio—perhaps tilting toward dimensions of size, value or profitability as we recommend—investors planning long-term outcomes should understand the potential benefits and risks of doing so. In addition, there is no shortage of things investors can do to help contribute to a better investment experience. Working closely with a knowledgeable CFP® professional can help individual investors create an integrated plan that better fits the needs, values and risk preferences of their families. Pursuing a globally diversified approach without U.S. familiarity bias; managing expenses, turnover, and taxes; and staying disciplined through market volatility and positioned to see market declines as opportunities not to be feared; all can help improve investors’ chances of achieving their long-term financial goals, and gaining greater peace of mind through a professional wealth management process. Fashionable investment approaches will come and go, but investors should remember that a long-term, disciplined investment approach based on robust research grounded in the science of capital markets and smart flexible implementation may be the most reliable path to truly capturing the potential of what global capital markets have to offer. CFP® professionals are fiduciaries with a duty of loyalty and care, and individually licensed by the Certified Financial Planner Board of Standards. 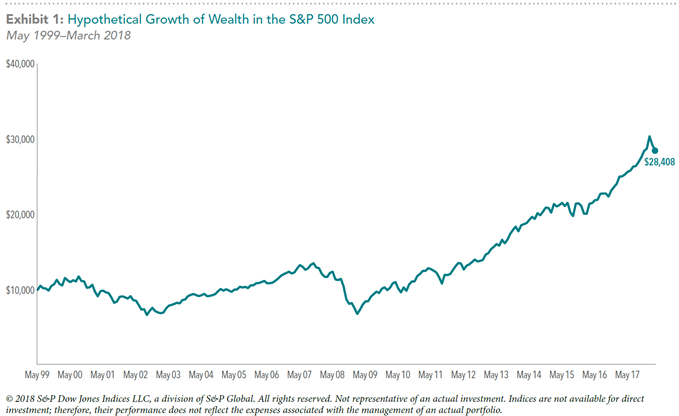 Source: Dimensional Fund Advisors LP. Past performance may not be indicative of future results. This information is provided for educational purposes only and should not be considered investment advice or a solicitation to buy or sell securities. There is no assurance that any investing strategy will be successful. Diversification does not eliminate the risk of market loss. All expressions of opinion are subject to change. This article is distributed for informational purposes, and it is not to be construed as an offer, solicitation, recommendation, or endorsement of any particular security, products, or services. Investors should talk to a knowledgeable financial advisor or CFP® professional prior to making any investment decision. Eugene Fama and Kenneth R. French are members of the Board of Directors of the general partner of, and provides consulting services to, Dimensional Fund Advisors LP. U.S. stock markets and many international developed markets grew strongly during a very long bull run in the aftermath of the global market crisis of 2007-2009. Over the last three years, an unusually low level of market volatility has been noted frequently by many commentators. During this last quarter of 2018, that low volatility has given way to the steepest decline since 2002, steeper even than that of 2008, which like 2002, continued to decline even further. The S&P 500 index had dropped 15% in December until this last week. With the stabilization of the last three days, will markets continue to decline? We don’t know. And for policy management of multi-dimensional structured strategies, it should not matter. The increased volatility of the stock markets has caused anxiety for many investors, new and old. The Dow Jones Averages had declined nearly 20% (to constitute a “bear” market) but many factor indexes show declines of more than 20% based on prices since the year 2018 began. Most of our clients with balanced equity/fixed income strategies, however, will experience much-reduced negative performance for 2018, likely ranging between minus 6% to minus 8%. While I am sorry for the unhappy news, that is well within normal parameters. Media — like the Journal — and industry experts will endlessly speculate and prognosticate regarding which political or social event is driving market turbulence (most likely rising interest rates, aided and abetting the Federal Reserve in our opinion). But the driving force of huge swings is almost certainly the new technological reality that roughly 85% of all major market trading is on autopilot—controlled by machines, models, or passive investing formulas. These collectively have created an unprecedented massive herd of robot investors that trades incredibly fast in unison. Human beings simply don’t react that fast. But this is a new era. Algorithms, or investment recipes, automatically buy and sell based on pre-set inputs or simplified forms of artificial intelligence. “Momentum” of market movements is a critical factor input. Today, quantitative hedge funds, or those that rely on mathematical computer models rather than on traditional research and human intuition, account for 28.7% of trading in the stock market, according to the Tabb Group — doubled since 2013. Add to that an increasing number of passive funds such as ETFs, index investors, market makers, and those not buying because of fundamental views such as Dimensional Fund Advisors, and you get about 85% of all trading volume according to JP Morgan. Herein is crisis and along with it, a new opportunity for investing. WHAT ACTION HAS PROFESSIONAL FINANCIAL TAKEN FOR CLIENTS? On Friday the 21st and Monday the 24th we rebalanced most clients’ portfolios in a simplified but customized manner back to target policy allocations. We do not depend on an automated rebalancing algorithm. We call this our “Phase One” of our management process in a decline. Since we largely employ Dimensional funds that trade as of day end, we waited for a special period of bad news and a day that most machines would not operate. Friday tends to be the day, since quants don’t want open positions over a weekend and I guessed that most had booked a fancy holiday get-away and either would be unlikely to change plans or be able to do so. It created optimal conditions for rebalancing. It was a gift that just kept on giving. The two days after Christmas were a record rise for the Dow Jones average and major U.S. indexes. Blind faith in machines and models leaves investors vulnerable to biased and irrational outcomes. The solution? 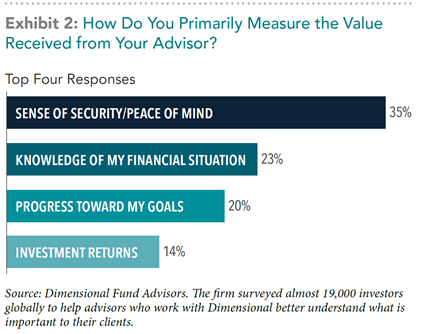 That which Dimensional Fund Advisors has used in its trading process since its inception — a healthy dose of skepticism and human oversight when trading securities. Remember this about computers and robo-advisors: it’s an algorithm, not an authority. While peace of mind may not have been part of the holiday season due to continuing market declines and substantial swings, volatility is a normal part of all investing. Risk and expected return are related. The idyllic pattern of growth of the past several years that sucked in so many investors to make big bets by over-allocating into U.S. growth stocks could not last. Additionally, we all know that reacting emotionally to turbulent markets and changing sensible investment strategies and management process is likely to be far more harmful to long-term outcomes and peace of mind than a periodic market drawdown. We remember that we have to be right twice: both when you sell, and then when you buy back. We will discuss these matters more in our next Planning Perspectives. Should you have questions about our actions before our next planning meeting or have concerns about “Phase 2” should global markets continue their declines into 2019, please call or email us. This is what we’ve expected for months. The problem is, when we get what we want, we may not want what we get — at least for a while. For those upset by the news, turn off the computer, and ignore the media. Enjoy family and friends as we welcome in what may yet be a very happy New Year. Costs matter. Whether you’re buying a car or selecting investments for your portfolio, the costs you expect to pay are likely an important factor in making a financial decision. People rely on different sources of information to make informed decisions. When buying a car, for example, the sticker price indicates about how much you may expect to pay for a car. But the costs of car ownership do not end there. Taxes, insurance, fuel, routine maintenance, and unexpected repairs (and where repairs are made) must be considered for complete ownership costs. While some costs are easily observable, other equally important ownership costs are obscure. Similarly, when selecting investment vehicles for constructing a portfolio both explicit and implicit costs must be considered to properly evaluate how cost‑effective a wealth planning strategy may be. Mutual funds are the simplest way to illustrate this. Like all investments, mutual funds have differing management costs, all of which impact net investor return. The most easily observable measure of cost to identify is the expense ratio, which must be disclosed. Like a car’s sticker price, expense ratios tells you much about what you can expect to pay for different mutual and exchange traded funds. For investors looking to save on costs, expense ratios influence many decisions. Exhibit 1 illustrates the “outperformance rate” for the proportion of surviving active equity mutual funds beating their relative category index over a 15-year period. To clarify the link between expense ratio and performance, outperformance rates are shown by quartiles and sorted by their expense ratios. The chart shows that the outperformance rate of active funds has not only lagged but been inversely related to expense ratio. 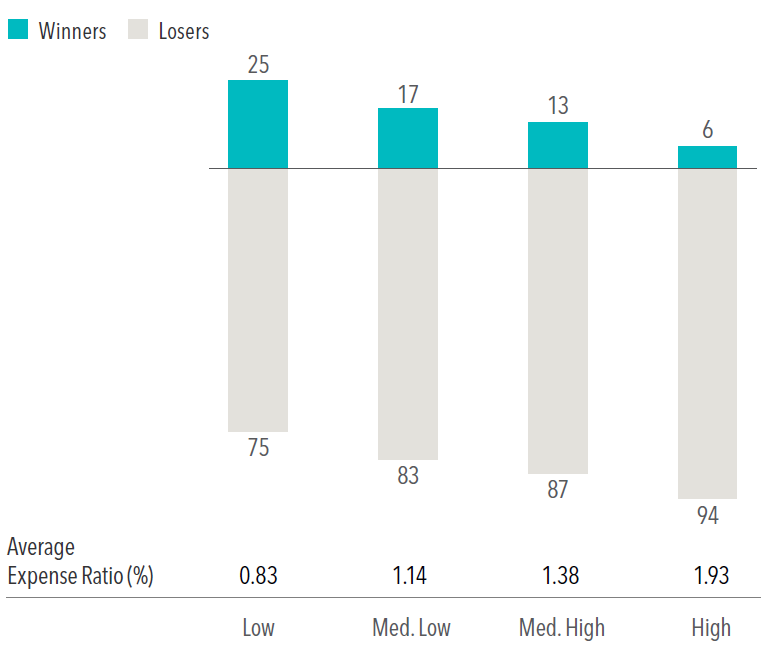 Just 6% of active funds in the highest expense ratio quartile beat their index, compared to 25% for the lowest expense ratio quartile. ﻿Index funds and fund-of-funds are excluded from the sample. The return, expense ratio, and turnover for funds with multiple share classes are taken as the asset-weighted average of the individual share class observations. For additional methodology, please refer to Dimensional Fund Advisors’ brochure, Mutual Fund Landscape 2018. Past performance is no guarantee of future results. Dead weight from high expense ratios presents a challenging hurdle for many active equity funds to overcome. From the investor’s viewpoint, selecting among funds with similar asset allocations having a low expense ratio of 0.25% vs. those about 1.25% potentially could mean savings of $10,000 per year on every $1 million invested. As Exhibit 2 illustrates, that difference can add up over time. However, at least some investment managers of higher-cost funds may be able to enhance performance sufficiently to offset their high costs. The poor track record of so many active mutual funds with high expense ratios has led many investors to select mutual funds based solely on expense ratio. That could be a mistake. As with a car’s sticker price, an expense ratio does not measure the complete cost of ownership. For example, index funds often rank near the bottom of their peers’ expense ratios. These funds are designed to track or match the components of arbitrary indexes formulated by commercial index providers, such as Russell or MSCI. Important investment management decisions, such as which securities to include or exclude, are not within an index fund manager’s discretion and effectively outsourced to the index provider. Additionally, the prescribed reconstitution schedule for an index, when certain stocks are added or deleted to that index, may force index fund managers to buy stocks when demand is high and sell stocks when demand is low, increasing costs. Price-insensitive buying and selling is required for an index fund to “stay true” to the underlying index mandate. Diminished overall returns can result from sub-optimal transactions: for a given amount of trading (or turnover), the cost per unit due to a strictly regimented trading tends to be higher. These indirect costs are unpublished. Further, because indices of commercial providers are reconstituted only infrequently (typically once per year), index funds that track them buy and sell underlying holdings based on stale eligibility criteria. For example, the characteristics of a particular “value” stock1 may have changed since the last reconstitution date, but those changes would not affect that stock’s inclusion in its commercial value index. Incoming cash flows into a value index fund, say, may continue to purchase securities that could be more like growth stocks2 (and vice versa). To avoid being different than the index they mimic, index managers invest using a rear-view mirror rather than watching the road ahead. ﻿For active stock picking approaches, both the total amount of trading and the cost per trade usually will be higher than with indexing strategies. If an active manager trades excessively or inefficiently, commissions and price impact from increased trading will progressively eat away at returns. Using our car analogy, this is like incessantly jamming on the brakes or accelerating quickly. Subjecting any car to such abusive treatment results in added wear and tear and greater fuel consumption, increasing the total cost of ownership over time. Moreover, for investors holding funds in taxable accounts, excessive trading increases cost of ownership by realizing income subject to tax sooner. Unnecessary turnover and higher costs per trade can be avoided, such as with portfolio strategies managed by Dimensional Fund Advisors. In contrast to both highly regimented index and high-turnover active strategies, a flexible management approach reduces the costs of immediacy, and thus enables opportunistic execution. Reducing implicit costs adds value. Keeping turnover low, remaining flexible, and transacting only when the potential benefits of a trade outweigh the costs, help keep overall trading costs even lower. This not only reduces complete total costs of ownership but also translates into higher portfolio returns. Estimating the complete cost of owning any investment vehicle, like mutual funds, can be difficult to assess in advance. There are both implicit and explicit costs. Deciding requires a thorough understanding of costs beyond looking at expense ratio disclosures. Investors should think beyond any single cost metric and instead evaluate the total cost of ownership relative to the potential total benefit for total portfolio return based on a clear understanding of how a management methodology may reliably improve results. Rather than focus too much time on evaluating investment costs, successful families should spend more time evaluating independent Certified Financial PlannerTM professionals with the right education and expertise that may help them take control of their financial future and make the truly informed decisions necessary to gain real peace of mind and enjoy a more abundant retirement. 1A stock trading at a low price relative to a measure of fundamental value, such as book value or earnings. 2 A stock trading at a high price relative to a measure of fundamental value, such as book value or earnings.